Traffic: The number of visitors who come into your store. Now, a lot of marketers pour their money into traffic, and it’s an important factor. After all, getting people in the door is the only sure fire way to grow revenues, as long as your conversion rate stays the same. However, in many B2B industries, the level of traffic is going to be highly limited. This is especially true when a firm is limited to a territory. It's like having the only 7-11 within a 10 mile radius, but in a sparsely populated area. In this case, there is a finite number of customers who will be coming to your site, and that means you can only improve conversion rates and average order value if you want higher revenues. It turns out, though, that offering flexible payment methods is an excellent vehicle for increasing conversion rates. On top of that, by increasing conversion rates with flexible payments, you can also improve both traffic and average order value. Let’s take a closer look at how this works. 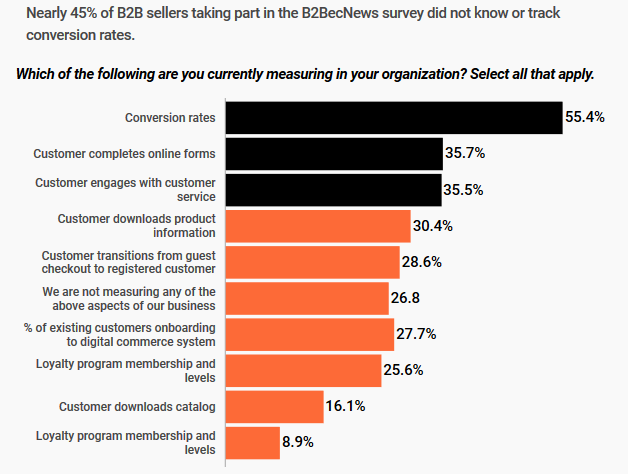 First off, it’s shocking how only about half of all B2B firms are tracking conversion rates, according to a B2BNews survey. Let’s be blunt: If you’re a B2B e-commerce firm that isn’t tracking conversion rates you are flying completely blind. Conversions are the ultimate measure of whether or not your site is working. Not knowing your site’s conversion rate is, to return to our retail analogy, like not knowing how many people purchased something from your store after entering. By knowing your conversion rate, you can start testing and analyzing various aspects of the e-commerce process—such as traffic. Because of the importance of conversion rates, payments play a huge role in determining it. Think of it like this: You work hard and spend money on getting people into your birck and mortar store, and you've made sure all the merchandise and displays are in tip-top shape to encourage sales. What happens, though, when a customer get sto the checkout process and has to fill out a 20-page form just to pay? You've definitely never seen that in a retail setting. Yet, many B2B firms require customers to submit complex forms in order to complete a sale, much less apply for trade credit. And when this happens, chances are the customer walks away and your conversion rate dips. But by offering flexible payment options, buyers are more likely to complete the transaction, thus boosting your conversion rate. In fact, approximately 45 percent of B2B buyers say that having an efficient checkout experience is an important website feature when making a purchasing decision. If knowing your conversion rate is like knowing the percentage of people who bought something from you, then knowing your average order value is like knowing how how much they spent on average. 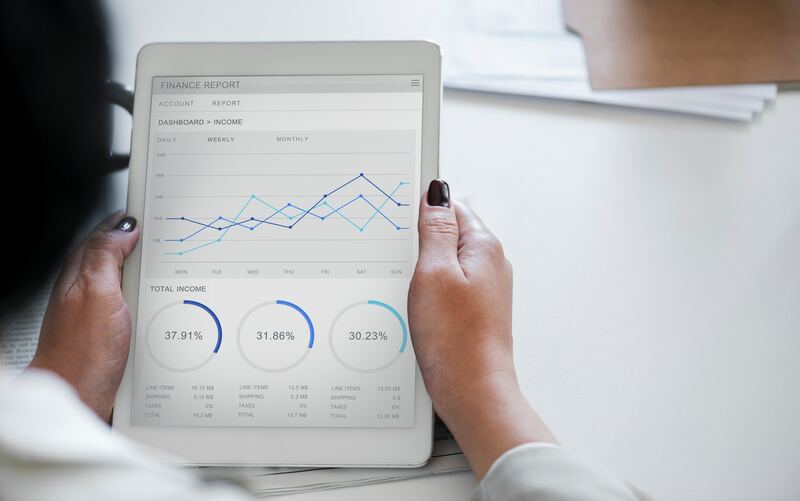 Translating that to e-commerce: Your average order value (AOV) can help you quickly benchmark and determine the overall health of your e-commerce operation, as well as return on investment for marketing. When it comes to making purchases, offering flexible payment options can be the carrot that tips buyers to spend just a little extra money (ultimately increasing your AOV). For example, if your buyers typically spend $8,000 per order on a widget, what would happen if they suddenly has $10,000 to spend? In many cases, they’ll spend that extra $2,000 to increase their stock of your product, especially if that means they can increase their own revenues. This is a bit of an oversimplification of the buying process, but the fact remains that most B2B buyers would prefer to get more of their purchases faster than have to wait for a later buying round. We purposely saved this one for last, particularly given the challenges of driving traffic in a finite market. As mentioned above, distributors and other B2B business are often limited by territory, which means there is a limited number of businesses that they can sell to. It also means there’s a limited number of buyers looking for a particular product at any given time. Again, it's like a 7-11 situated in a sparsely populated area. While flexible payments can’t really have an impact on attracting new visitors to your website (though it can be used in your marketing—but that’s a topic for a different post), it can still help improve traffic. How? By offering a line of credit, you’re more likely to get repeat buyers, especially if the product they’re buying from is routine. Think about it this way: When a B2B buyer needs to purchase something they’ve already purchased before, are they more likely to go to a new company or the company where they have a line of credit? Most likely, they’ll go to the one where they have a line of credit, as it simply makes the purchasing process easier. And, obviously, the more repeat buyers you get, the bigger your revenue! If you’d like to get more information about how Credit Key can help you increase your traffic, conversion rate, and average order values, contact us. 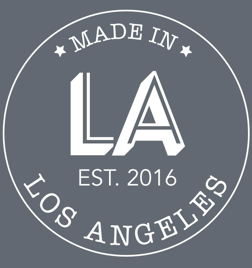 We’re happy to show you the impact we can have on your revenue.